Team played really well, deserved to win the game, could have had more! 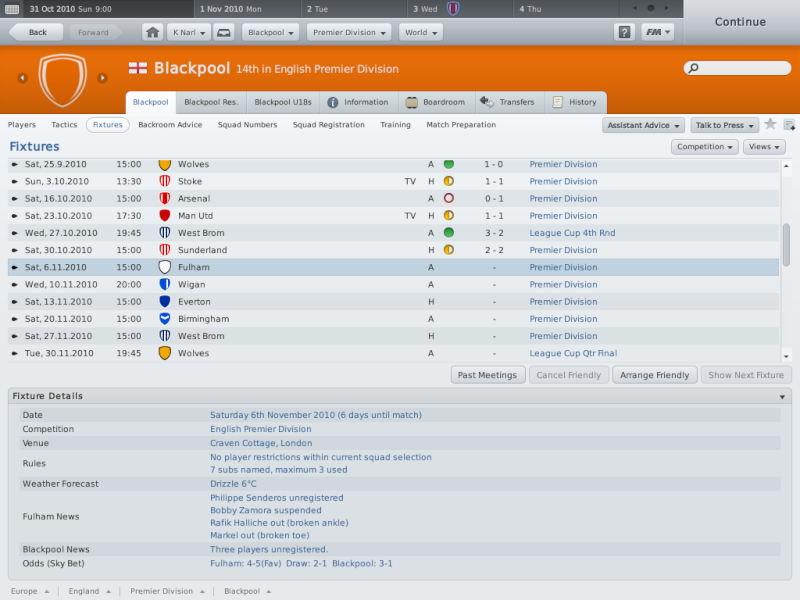 That Liverpool draw has kick-started my season I think! Excellent stuff, Narl - amazing result against Villa too! Keep up the good work, and I'm sure it'll pay off. 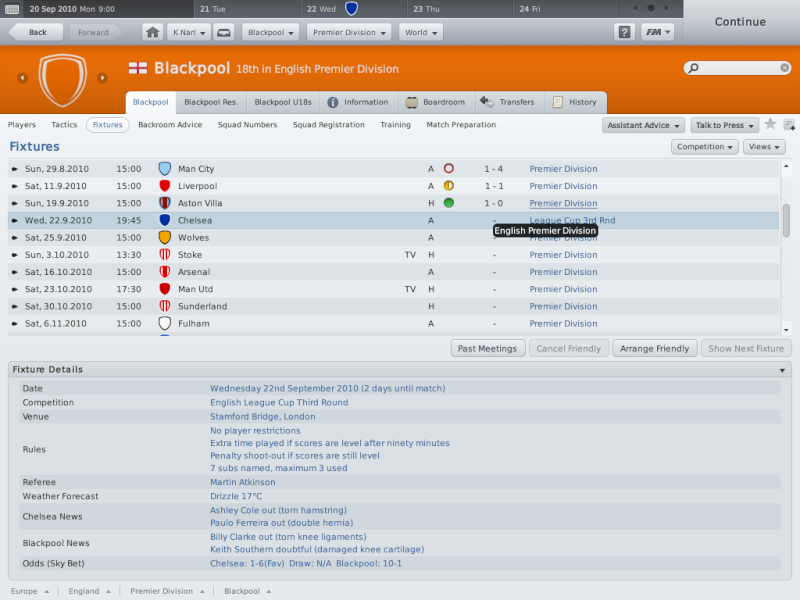 Well, looking ahead of the Villa game, I didn't like the prospect of my fixtures. First up was a tough away game to Chelsea in the league cup, who knew what kind of side they would put out, but I soon found that out! Now, I thought Chelsea would have put out a decent side to play me, as they are the league champions after all, and I would think they'd like to win the quadruple. But I was wrong and I had hope that we might pull off a result... and boy did we ever! 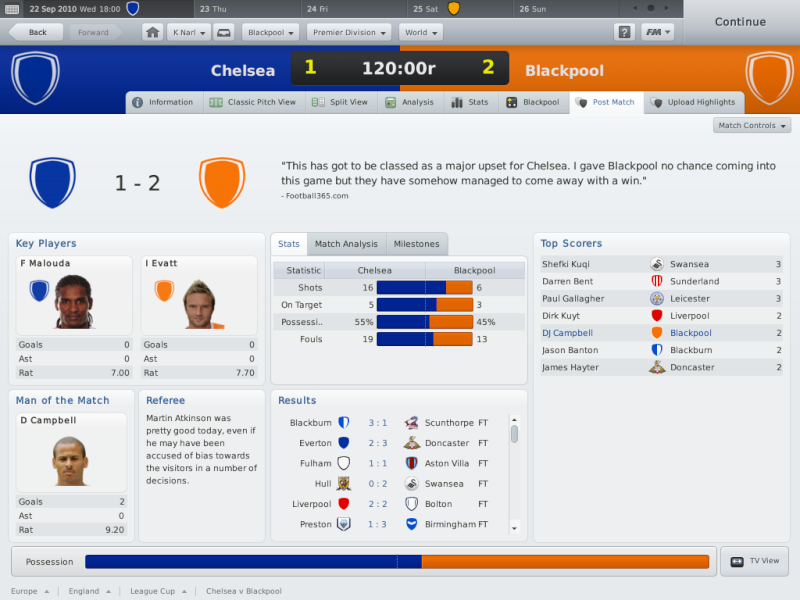 2-1 , 2 goals by DJ Campbell, one coming in the 115th minute of Extra Time to give Blackpool the win and through to the next round of the cup! Good going, cant wait to see how the monkey does. I'm at January now in my Newcastle game, I've signed Joe Mattock from WBA for 2m; he's a great one for the future, shall provide much-needed competition for Jose Enrique too. That's what he's been lacking so far this term. 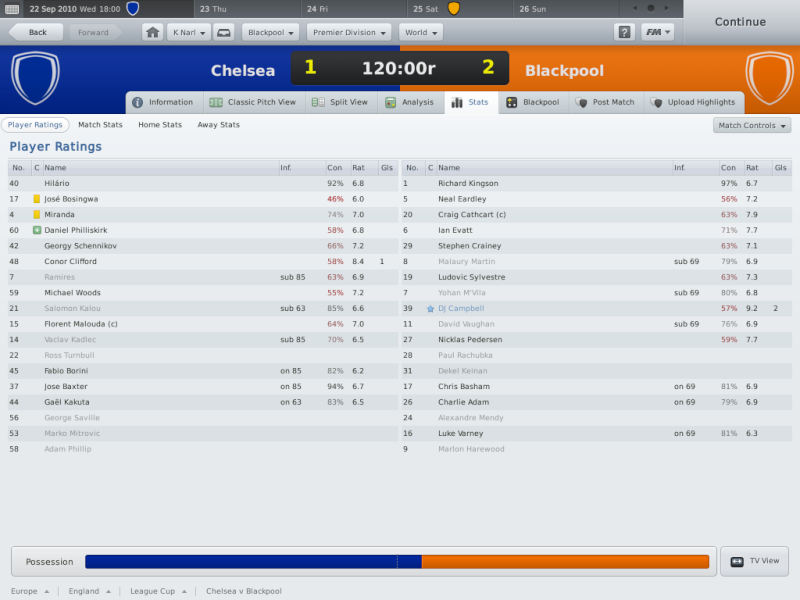 11th in the Premiership; played 22... won 7, drawn 7, and lost 8. What's everyone else up to in their games!? Post!!! Haha nice one Niko, I'm sure you're gonna win the league with them anyways! Newport winning the league cup in league 2, the premiership should be a piece of cake! Well done Niko - you should do quite well there to be honest - keep it up though! 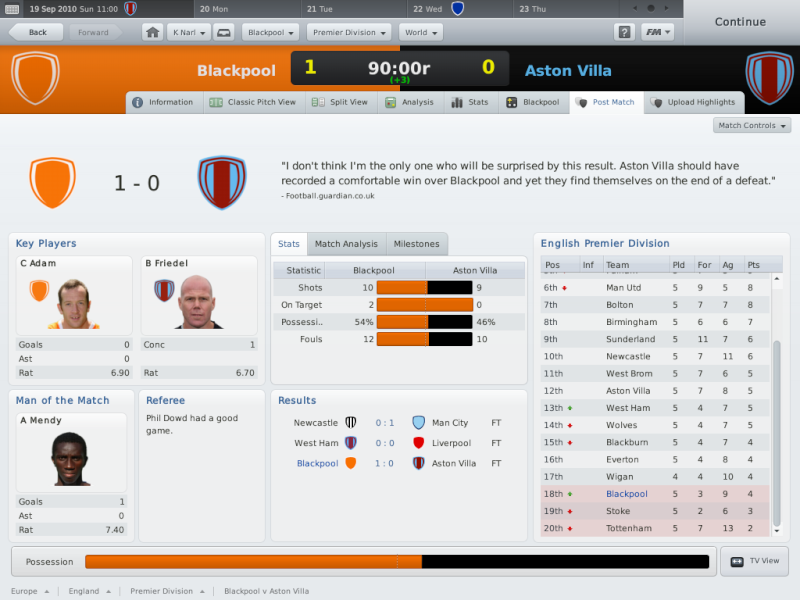 I signed 'Magic' Madjid Bougherra for £2.5m from Rangers in January; he's solid, love him. Ancelotti and Mancini got the sack from Chelsea and Man City. Mancini took over Chelsea (:O), City appointed Atletico's Flores. Mick McCarthy took the Fulham job, Ian Holloway took the vacant Wolves job and then Big Sam Allardyce - who was sacked from the Blackburn job in January, and replaced by Shearer - took the Blackpool job. 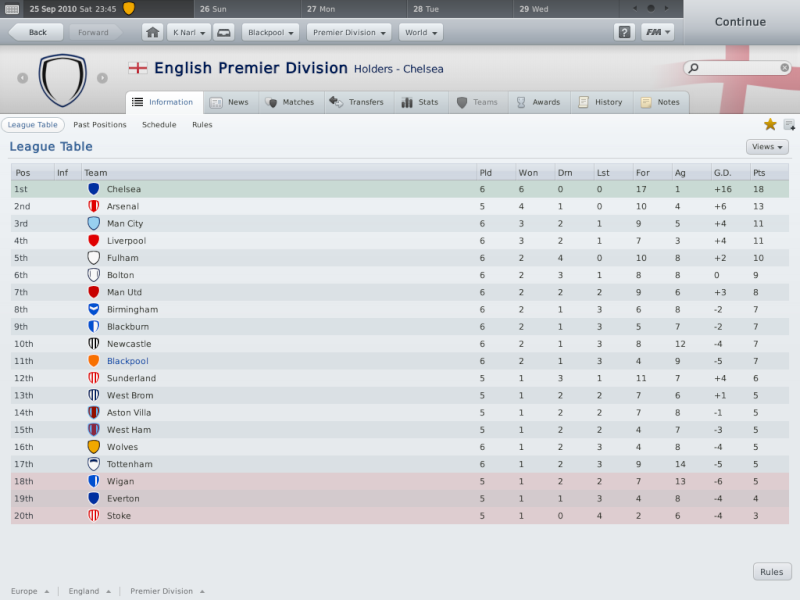 Wow Berry - that's an interesting season and an excellent league position, well done, keep it up for Season 2 . Decent signings mate, a right bargain with Micah Richards! You should do very well this season! You also have a favourable draw in the Europa League, should advance to the next round quite easily. Where you reckon I could improve the squad? Anywhere that needs a extra signing? Adrian Mutu in for £1.6m and Jonas out for £4m helps with finances too. I wasn't playing Jonas either, as he wanted out at start of season - said he wanted to leave for a bigger club. Fool. Great squad there Berry, what formation do you play? Quite a few to be honest mate; I like to mix it up, keeps the other team guessing that way. Usually it's an attacking 4-4-2, with wing forwards. I also use 4-4-1-1 sometimes, aswell as 4-5-1. Newcastle win the Premier League title with 3 games spare! Can the Toon do it? I hope so! 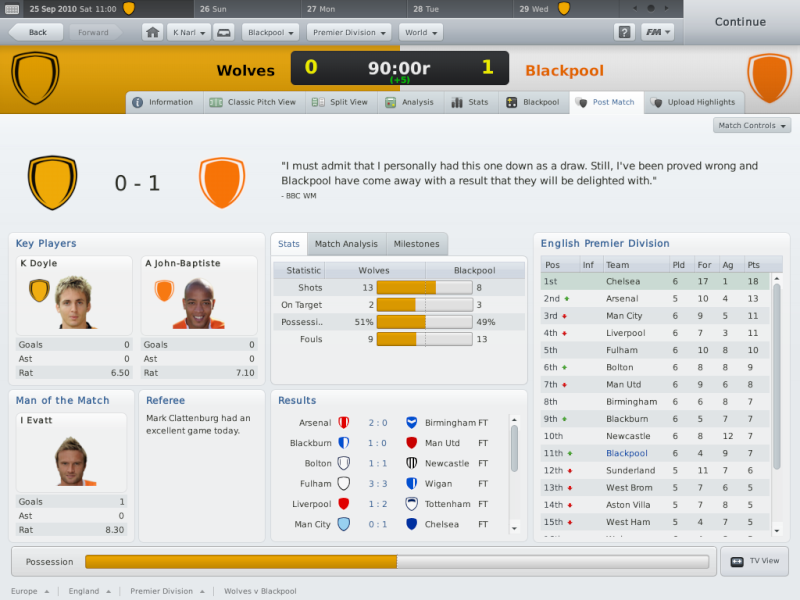 And the FA Cup final too... jesus haha, The Toon are gonna do the double!!!! Thanks mate; summer signings Carrizo, Micah & Toivonen have been really important players for me this season, been very consistently impressive. Just hope I can keep hold of my key players for the next season, should be able to do. We're the champions! Amazing work Berry - much deserved! Now bring that FA Cup home and become Double Winners. NEWCASTLE WIN THE FA CUP TO DO THE 'DOUBLE'! Here are the goals from Danny Guthrie, he really came up with the goods for us. It was a good job he did too, as Toivonen just couldn't score. As flattering as a offer from the sleeping giants Milan is, my work at Newcastle isn't done. All this progress I've made doesn't deserve to be built on by another manager, I must secure Newcastle as a top 4 club. I quite like Newcastle, prefer them over Man City any day haha. Nice one mate, what a platform for next season, doing the double! I think I'll add and sub to you on youtube as well! Great stuff mate, can't wait till next season! Ooo, that would've been tempting mate, but you've had such a great two seasons at Newcastle, it'll be interesting to see how you do in your first season in the Champions League. I hope you get past at least the group stage, as this will provide you with a good financial backing. Have you had your transfer budget yet? Awesome mate, can't wait to see who you've bought for the forthcoming season. If you get a easy group you should cope fine but if you get a group like tottenham did youll have to put your heart out to it and hope for the best and actually hope you scrape through depends what your tactics are and formation id say go 4-4-1-1 in europe. up front have carrol and Toivonen behind doing all the through balls. I've just started this again, I am now at West Brom, and have already signed Rafael and Gael Kakuta on loan for the season. I can do what I want, thanks! Gael Kakuta, Rafael da Silva in on loan for the season, with Amr Zaki coming in for £3m. First game of the season is at home against Wolves! Good luck mate, come on West Brom. Wow, what an incredibly insightful post! Do you know how to scout players, and find players yourself? How much have you got? what position do you need? Who's interested? Agreed, no edited teams in here please. As always, I conduct all my business before I even push the first continue button. It seems to help to get a jump on the transfer markets. I can literally spend hours doing this before I even get into the game. To me its the best part of the game. So far I have been very busy. WBA have way too many Strikers on the books, 8 of them and they all want First team Football, but are not quite consistent enough for it. I will keep Ishmael Miller out of that bunch, the rest can go.